Look at our collection of triangle cut loose diamond pairs if you are interested in designing your own three-stone ring, diamond stud earrings or a diamond pendant. We have a fantastic collection of triangle (also referred to as trillion or trilliant diamonds) cut loose diamond pairs on our website. We can customize you a three-stone diamond engagement ring or diamond pendant necklace setting with these unusual diamond pairs. Whether you are looking to match a 3 carat round center stone for an engagement ring or a 1 carat marquise center stone for a pendant necklace, we can help you find the perfect layout. 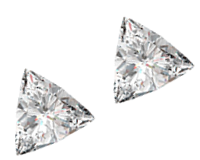 Triangle shaped diamond pairs can be used as side stones for almost any center stone shape, such as the emerald, Princess, radiant, oval or cushion cut diamond.